IN HIS little-known prophetic message for the Church today, Jesus promised that He would set before us an open DOOR for the spreading of the gospel. Notice Jesus' own words for our church today: "I know thy works: behold, I have set before thee an open DOOR, and no man can shut it: for thou hast a little strength, and hast kept my word" (Rev. 3:8). This DOOR — the opportunity of spreading the gospel (II Cor. 2:12) — includes today the means of RADIO and the PRINTING PRESS! The true Church of God today has little strength in this degenerate age. It has no great financial resources, yet through Jesus' miraculous guidance this great work is constantly expanding around the world — now to Australia, and with radio time this month available to go to all Europe in the German language. It is not the work of one man, nor even of two dozen men. It is the work of every member of God's Church — everyone of you! The Church Is a TEAM! One fundamental lesson we all need to learn in this world is the need for teamwork. Even in athletics, the best players can't achieve victory unless the entire team works together in perfect cooperation and coordination. The apostle Paul taught the need of teamwork by saying that the church is one body although composed of many members. Every truly converted Christian has his specific function in the Church just as each organ of a human body has its function. "But now hath God set the members every one of them in the body, as it hath pleased him... And the eye cannot say unto the hand, I have no need of thee: nor again the head to the feet, I have no need of you" (I Cor. 12:18-21). The Church is like a team or a body. Every member in the Church of God is essential. Perhaps it appears that those who help only through prayers, tithes, offerings, and letters of encouragement are of little need compared to preaching. Yet the work of God cannot function without every necessary part anymore than a human body can. "The WORLD TOMORROW" program would not be encircling the globe today if it were not for the constant prayers and faithful tithes and offerings of God's people. Paul said: "Nay, much more those members of the body, which seem to be more feeble, are necessary (I Cor. 12:22). The devil knows that one of the easiest methods of wrecking teamwork in the Church of God is to cause contention and division. It is a natural human tendency to precipitate strife and controversy. That is the special reason why each of us must strive against our carnal human nature and be on guard constantly to preserve harmony and teamwork in the spirit of love. Those Corinthians were still carnally minded. They wanted to be followers of important men. Some preferred the eloquent style of Apollos' preaching (Acts 18:24), others liked Peter's. Without realizing it they were getting into confusion and contentions over Paul, Apollos and Cephas who were faithful ministers of Christ. Just as then, so today many do not realize the harm that can be caused by factions within the Church. Wherever the spirit of strife, envy and dissension enters the church, it will embitter the brethren unless stamped out by God's ministers. Among those Corinthians the Adversary cleverly induced many to criticize and find fault with the labors of Paul. They began to say among themselves: "I don't believe Paul is doing this right. I am going to support Apollos from now on." After leading the Corinthian converts into fault finding, the devil's next step was secretly to introduce false brethren who set themselves up as ministers and who transformed "themselves into the apostles of Christ," and who professed to be "the ministers of righteousness" (II Cor. 11:13-15). Because they sought to follow men instead of Jesus Christ, it was only natural that the Corinthians would be led astray by smooth-talking false preachers. Knowing that human nature has not changed since then, Satan is trying this very method today in order to thwart the work of God and overthrow numerous brethren. It is so easy to criticize those whom God places in authority and whom He is using. For years the devil has struggled to gender the spirit of contention and rivalry. Satan knows that if he can embitter the brethren against God's ministers, particularly Mr. Armstrong, he can devour them and wreck the teamwork that is so essential among God's people. Satan is going about, as always, seeking whom he may devour. He will try every imaginable scheme to overthrow you brethren. How shall we preserve the wonderful spirit of cooperation which still permeates the Church today? Let us notice the method Paul used in order to maintain teamwork and loving cooperation among the churches. In I Corinthians 3:10 he wrote: "According to the grace of God which is given unto me, as a wise masterbuilder, I have laid the foundation, and another buildeth thereon." Jesus Christ used the apostle Paul directly in carrying the gospel to the Gentile nations. After Paul had founded the Corinthian church, Apollos was one of several evangelists who continued to build on the foundation which Paul laid. Paul and Apollos cooperated in every way possible; but Paul, who was an apostle, supervised the work of Apollos and generally directed his labors just as he did the labors of the other evangelists, Timothy, Titus and Silas (Titus 3:13). Undoubtedly one of the major reasons for the division at Corinth was the fact that Apollos, an eloquent speaker, had not been taught and trained personally by the apostle. Apollos was doctrinally in error on several points, particularly the distinction between the baptism of John and Jesus (Acts 18:24 and 19:1-7). No such controversy is noted between Paul and the other evangelists whom he personally trained. Paul realized that in order to preserve harmony and the spirit of cooperation, he had to direct Apollos and also train other young men who could serve him as evangelists. These young men who accompanied him on his journeys were under him in authority, in the same manner that Paul was under the authority of Christ. It was the government or rule of God. God the Father made His will known to Jesus who in turn made it known to Paul. The apostle then explained it to the evangelists who in turn taught it to the elders and the local congregations. Wherever Paul journeyed, the evangelists who built on his foundation were under his authority. But let us note another important principle found in Romans 15:20-22. Paul wrote: "Yea, so have I strived to preach the gospel, not where Christ was named, lest I should build upon another man's foundation: but as it is written, To whom he was not spoken of, they shall see: and they that have not heard shall understand." Here Paul quotes Scripture from the Old Testament to prove that those of apostolic rank, being the direct representatives of Jesus Christ, should not build where others have preached the true gospel of the kingdom of God. This is important for us to remember today. In order that the "WORLD TOMORROW" broadcast should not be hindered by duplication, God directs that no others of apostolic rank should build upon the foundation that Jesus Christ laid through the ministry of Mr. Armstrong. And all who do build on it must be under his direction and authority. The Bible itself plainly reveals that any other plan leads to confusion and trouble. Any individual or group not yet understanding this phase of the government of God is only going to cause confusion and dissension among God's people. Perhaps a little history is important at this juncture. Our Church is not a Church founded or built by Herbert W. Armstrong. It was founded in A.D. 31 by Jesus Christ. It is the very Church Jesus Christ built! HE is its governing Head. His Church has government, and that government is from the TOP down, through those whom Christ has set directly under Him in authority. When Mr. Armstrong first started preaching, he was under the authority of the Oregon Conference of the Church of God, now clearly identified in the light of carefully documented historical research as the "Sardis" church described prophetically by Jesus in Revelation 3:1-6. That church was not properly organized according to the New Testament pattern of God. Nevertheless Mr. Armstrong was under the authority of those holding offices of authority in that Conference. He was ordained by that Church — God's Church for that period — in the year 1931. He received salary from them, was sent by them, first to engage in a tent meeting in Eugene, Oregon, then to St. Helens, Oregon, and then to Umapine, Oregon. When the meeting at St. Helens ended, he waited there while the minister he was assigned to work with drove down to the Willamette Valley to obtain authority from the constituted Church Board to go on to Umapine and hold the meetings there. In those days, under the period of the "Sardis" Church, Mr. Armstrong was wholly UNDER authority. No one can ever be put IN authority under Christ until he has demonstrated by experience that he can faithfully be UNDER authority, and can loyally and faithfully participate in the TEAMWORK which constitutes the very structure of God's true Church. In early December, 1931, the Oregon Conference treasury was drained, and Mr. Armstrong was released from ministerial duties for the time being. He then re-entered the advertising and publishing field, becoming advertising manager and acting business manager of a daily newspaper. Those were the depression days. At the end of February, 1933, the president of the Oregon Conference came after Mr. Armstrong, and returned him and his family to Salem, Oregon. There, with another evangelist, he held a five months' evangelistic campaign under salary from and under the authority of the Oregon Conference, the Church of God — the "Sardis" Church of Rev. 3. After this campaign ended in July, 1933, Mr. Armstrong received a call from a family brought into the Church under his personal ministry in 1931, in Eugene, to open a campaign in a one-room country schoolhouse eight miles west of Eugene. But, before daring to accept this call, Mr. Armstrong waited for the Church Board to act and decide whether he could go, or whether he was to be sent to some other place. The Church Board decided to send him to this country schoolhouse west of Eugene. Mr. Armstrong went there, started those meetings UNDER AUTHORITY OF THE OFFICIALS OVER HIM IN THE CHURCH. Most of those in the Church today know nothing of this early history of the beginnings of what are described in Revelation 2 and 3 as the "Philadelphia" Church — which in fact is merely another time-era in the history of the CHURCH OF GOD, which Christ founded A.D. 31. Another vital point our present members do not know: Mr. Armstrong did not build what has developed into the "Philadelphia Church" ON ANY OTHER MAN'S FOUNDATION. He did not go to a place where a number of people, converted through another man's ministry, lived. He went where one family, brought into the Church through his own work, lived, and started preaching to people who never heard the Truth before. 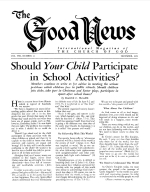 A goodly number were converted — brought INTO the Truth by his preaching in this six weeks' campaign — and a little Church of 19 members, the harvest of his own labors in the Lord, was organized. It was about the time of the close of these meetings that the Church Board demanded that Mr. Armstrong preach and act unscripturally. Two human "wolves in sheep's clothing," seeking to devour the flock, had come in from the outside and managed to charm and deceive the layman board officials. So far as carrying out the divinely commissioned PURPOSE of the Church — to proclaim Christ's Gospel to the world — the Sardis Church died at that point. Mr. and Mrs. Armstrong voluntarily relinquished the small salary, and solemnly placed themselves in GOD'S HANDS, relying solely and altogether upon GOD for guidance, for financial support and every need from that time on. After this, the DOOR WAS OPENED for the broadcast and publishing work. The broadcast began the first Sunday in 1934. The PLAIN TRUTH began February 1st, 1934. April 1st that year a campaign in downtown Eugene resulted in another small Church in Eugene, then late that fall and early winter another church of 15 members — all new converts — was raised up at Alvadore. These three were then combined into the one Church of God at Eugene, which has continued to this day. And that was the actual beginning of another era — the "Philadelphia Church" era — in the true Church of God, of which Jesus Christ is the Head. Since that time Mr. Armstrong has been solely, wholly, altogether UNDER THE DIRECT AUTHORITY OF JESUS CHRIST. What has been accomplished since then could never have been brought about by mere human power. The fruits abundantly reveal the mighty Hand and Power of ALMIGHTY GOD, who has ruled, governed, guided and directed — and blessed — this work ever since. Gradually, from that day to the present, the work of GOD'S CHURCH grew and grew. The sick have been healed. The true Gospel has been preached to all North America, and now to all Europe, and soon to ALL THE WORLD! Thousands of lives have been changed — converted into begotten children of God. The same fruits have been borne as under the apostles in the first two 19-year time-cycles of Christ's true Church. God Himself has revealed, by His blessings, miracles, and fruits borne, that He has chosen, and placed in apostolic power and authority in His Church, the minister whom He called and used through these years in the building and growth of the "Philadelphia" era of the true Church of God! Knowing the imperative need for young men to assist him, Mr. Armstrong was led to found Ambassador College in order to provide adequately trained and qualified help for the work in North America and now in Europe. This is the same pattern that Jesus himself followed. The Savior collected disciples (which means students or learners) and trained them. Jesus could not use them all, for we read in John 6:66, "From that time many of his disciples went back, and walked no more with him." Jesus had to test those whom he chose. The disciples had to demonstrate that they were willing to yield to the government of God the Father. In like manner today, Mr. Armstrong is extremely careful not to ordain any ministers or evangelists UNTIL they have first proved not only called of God, competent, and fully trained, but also that they are willing to submit unreservedly to the government of God, just as he, himself does, and has done from the start. This explains why none are ordained until they have completed at least four years of intensive training at Ambassador College in Pasadena, California, or in London, England. All who have a part in the ministry must learn to work together as a team. There can be no insubordination — the very sin of the devil who wanted to carry out his own will instead of that of the Creator. The work of spreading the gospel is so important, and its enemies are so numerous and deceptive, that it is vital for everyone of you brethren to realize the necessity of teamwork in God's Church today. Only through constant prayer and Bible study can we maintain a spirit of love and cooperation so that no effort of the devil can interfere with the peace and harmony that must reign in the Church of God. Let us all do our part on God's team, whether it be small or great, each part is absolutely essential for the growth of the work.